Allie: As an Independent Girlcat of Means... of a certain age... I realize how very fortunate I've been in life. I'm showered with affection, given the birthday gift of a lovely new collar (with bling!). *sigh* Pink AND diamonds. Can it get any better? But I recall all too well what it was like to live a hardscrabble existence, living paw-to-mouth on my own, not knowing where my next meal was coming from or even if I was truly safe. So for my birthday, I decided to give all 9 of my birthday wishes to those less fortunate. Please leave a comment below ~ for every comment, we'll donate to help ensure Allie's wishes come true. 1. I wish for shelter, warm and dry, for all homeless animals. 2. I wish that none are ever left hungry. 3. I wish for humans to understand that we are a forever commitment, not a passing fad. 4. I wish that humans everywhere would agree that abandonment is considered unlawful neglect. 5. I wish that cruelty would be considered a crime when perpetrated against animals, too. 6. I wish that people would understand that "bully" is not a breed, and legislation banning them is wrong. 7. I wish that diseases that savagely ravage tiny bodies, such as feline leukemia, would be eradicated from this earth. 8. I wish for humans to understand the necessity for spay/neuter. 9. And that as a result, I wish that we could lower the euthanization rate in shelters to much less than the current 50%. Do you have similar wishes? We're looking for people to join Allie in voicing their wishes for a better tomorrow. I'm working on a video project that will do exactly that: send a message about our vision for the future of all companion animals ~ dogs, cats, ferrets, bunnies. This video message will be addressed to our leaders, to the generation to come, to the ones who can make a difference. If you would like to be a part of this video project, please email me at tonkstail (at) gmail (dot) com. for the warm birthday wishes! Happy Birthday Allie. You've become a very wise ladycat in your 9 years and have wonderful birthday wishes for all animals. Happy Birthday, Allie. Your wishes are beautiful, thoughtful and inspiring. Our wish is that all of your wishes come true. Happy birthday! And what pawsome wishes! These are amazing birthday wishes, Allie! I hope they ALL come true. Woah ... 9 ! 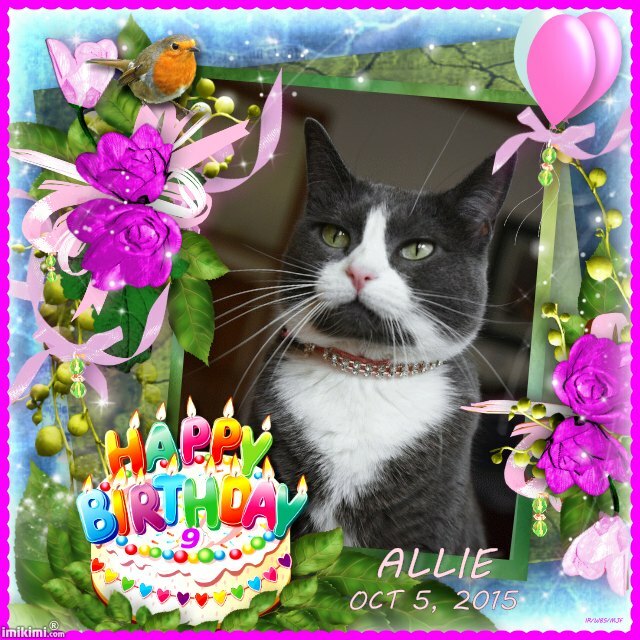 Weow Allie, happy burrfday gurlfurriend!!! Such lovely wishes, my wish is that all your wishes come true! Allie, we wish for those things to come true as well. The very best of luck with your commentathon and with the video project. Happy birthday, Allie! The head peep owes you some audio wishes, but we wish all of those things come true. We also wish that all humans would protect and cherish their kitties as much as you are protected and loved. Happy Birthday Allie!!! I hope all your wishes come true soon. Happy Birthday, beautiful girl, and may every one of your wishes come true!!! Those are beautiful wishes Allie. You are a very lucky indeed to have such a wonderful forever home. I wish that all victims of domestic violence and their pets are safe. I wish all DV shelters and homeless shelters would be required to accept PEOPLE WITH PETS. Nicole, that's an absolutely WONDERFUL wish - and so IMPORTANT!!! We *need* to include this in our video!! Happy birthday, Allie! I agree with all your wishes! Happy happy birthday Allie. Those are ALL great wishes. WE too so wish that all animals had safe loving homes. It breaks our heart that ALL of them can't be saved and that there are some awful things that happen. We think awareness is a big key and we will continue to wish for zero homeless animals. Happy Birthday! I'm a fresh 9 too, so we are the same age, and I love fancy collars too! I'm sad you didn't wish for a dog on your list, but otherwise, it is a very nice list. Have a wonderful birthday! I sent you an email question about the video. ☺ Thanks for sharing your birthday wishes with us. Happy 9th Birthday pretty Allie. We wish that all your wishes come true, because they are some awesome wishes. Thanks for sharing. We had to use 'I' to make it work, MOL! But we both agree, your wishes are pawsome, and we hope evfurry fur has them come true! C/P the URL then you can save/post or whatevfur! Once again Happy Birthday, Allie! Happy Birthday, Allie! Your new collar is just fab, Darling! We wish for all the same things. We hate to think of a single kitty (or any other animal) being hungry, cold or lonely. Happy Birthday Allie! Those are lovely wishes to have and I hope they all come true. Your new collar is beautiful. Happy, Happy Birthday sweet girl! Those are the loveliest wishes. We wish the same things, too. Always keep purring for a better tomorrow. Happy Birthday Allie. I would have never guessed that you are 9 you don't look a day older than 2! Those are wonderful wishes. I wish for more affordable health care for animals. What a great Birthday wish!! We agree with you fully! Happy Birthday to you sweet ladycat!! PS Mom loves the collar! Happy Birthday, Allie! We purr all your wishes come true! The only wish I would add, Allie, is that more people would work to achieve the goals you've listed instead of only a handful. But at least we are surrounded by caring people who are doing that right now. Happy Purrs Day! Happy Happy belated 9th Birthday , Allie ! Cheers for many many more to come ! Your 9 wishes list ROCK´S !